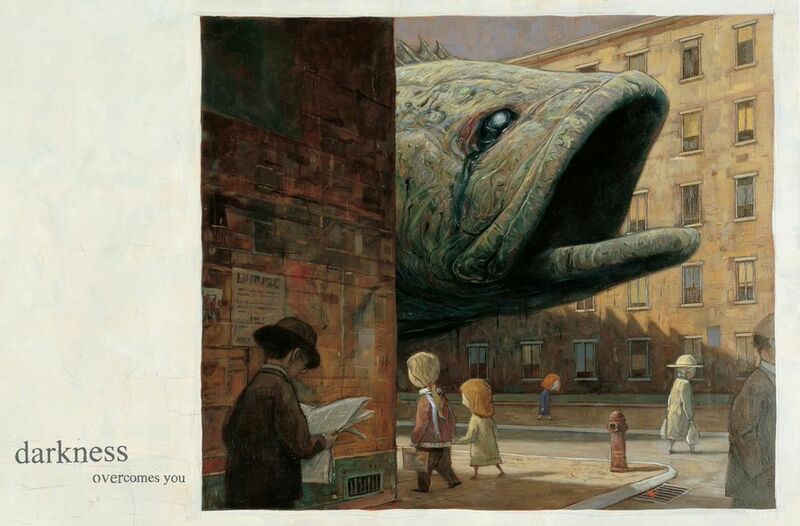 Shaun Tan is truly a picture book hero of mine. His work is mysterious and deep and dark and beautiful. It hits so close to home and one never outgrows it. In fact, you may have to grow a bit to fully understand it. Let’s talk about his picture books, okay? 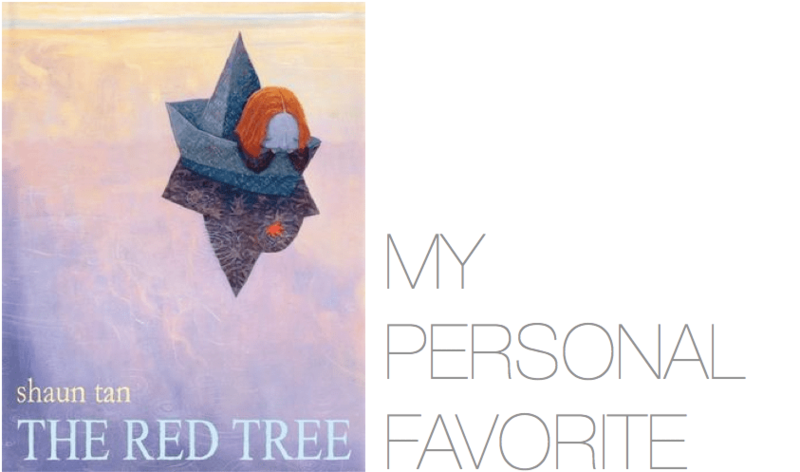 My favorite: The Red Tree. I’ve written about this one before. According to Shaun Tan, the story is “emotions as landscapes.” Specifically, feelings of depression, overwhelm, alienation, and confusion. Those feelings become Tan’s signature settings: strange, mechanical worlds. He also leaves small clues in the paintings. In this case, the tiny leaf on every spread foreshadows the red tree to come. See the tiny orange-haired girl above? And that red leaf by the fire hydrant, on the gutter? Tan’s works may be dark, but each concludes open-ended. There’s room for a red tree to magically sprout. There’s room for what comes next. Most celebrated: The Arrival. A wordless graphic novel meets picture book that portrays an immigrant experience in a way that looks like fantasy but captures the feeling fully and realistically. Made into an Oscar-winning animated short film: The Lost Thing. Here too, there’s so much to the setting. Layers and layers of visual clues. We recognize the story the (now grown) boy is telling us; it’s familiar. Even the place is familiar despite its cold, strange menace. A boy who collects bottle tops is a likely candidate to notice something else out of place. Something huge, but that no one else sees or can see. It’s a lost thing and it belongs with other lost, magical, wonderful things that very few notice. Especially after they grow up. 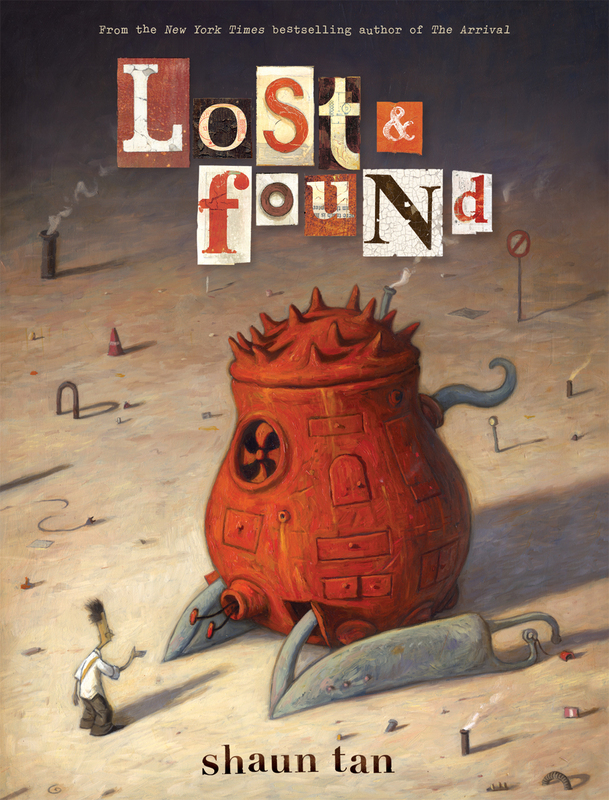 I highly recommend, Lost and Found: Three (2011), which is an anthology of: The Red Tree, The Lost Thing, and The Rabbits, with Tan’s commentary at the back. All three titles are not available individually in the U.S., so it’s a great way to get three in one! Plus, The Rabbits, Tan’s collaboration with John Marsden, is incredible. While some rules seem more random than others, there are commonalities. There’s always some threat of consequence (e.g. creepy red rabbit and black birds throughout). And there’s always some dynamic push-pull going on between these two boys, one clearly older than the other. For me, the absence of parents is important. It feels like these two characters live in a precarious, unpredictable world (perhaps all children do to some extent.) Because of that, their relationship is that much more important. And more fraught. They are everything to each other. The older brother protects the younger, instructs him, punishes, shuts him out, and betrays him. In the end though, always hope, in this case in the form of a rescue and the most scrumptious summer fruit parade that would make Wayne Thiebaud proud. Not to mention Tan’s trademarks: vast, desolate spaces and bizarre machines and creatures and layers and layers of paint. Thanks to Scholastic for images! 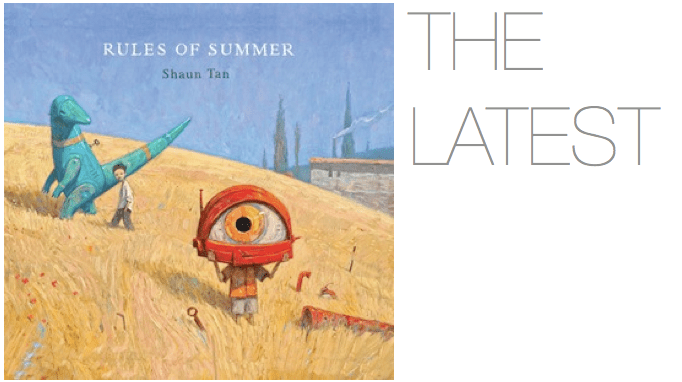 You can check out Shaun Tan’s website and he’s got a blog too, with process work, paintings, and more. Scholastic has generously provided one copy of Rules of Summer to give away! Enter to win by leaving a comment on this post! It’s that easy. I’ll contact the randomly chosen winner by email for your mailing address. Absolutely beautiful illustrations. Surreal and still whimsical, somehow! Beautiful books. Would love to have one for our library. Shaun’s work is incredible!! One of my new favorites. Thank you for sharing. 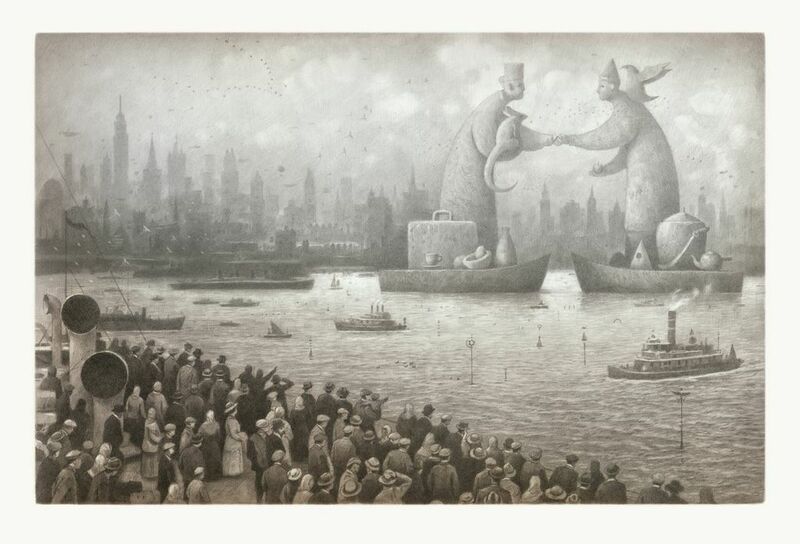 I have yet to meet anyone who is not mesmerized and awed by Shaun Tan’s work. Would love to have his Rules of Summer. Thank you for the giveaway! Just a comment? No hoops? Dang, I do like a good hoop! What I admire so about Tan’s books, is that he is making the books he WANTS to make. Go, Shaun! Indeed. They’re brave and like nothing else. Brave. I wanna make brave books! I’d love to win this beautiful book. Simply mesmerizing, every one. What a superb storyteller. I’d love to win. Thanks! Thank you for this post and thanks to Scholastic for offering this book. Shaun’s work is jaw-droppingly gorgeous. Please include me in the giveaway drawing! I had just seen Rules of Summer. These others look gorgeous, too! Thanks for highlighting them! P.S. I agree with Julie. It’s impressive that he’s making the books he WANTS to make. Very cool, indeed! What a great post about a fascinating gentleman. His books are incredibly unique. Beautiful! I’m starting a little library for my nephew, and Rules of Summer would be a great addition. WOW. Danielle, how, WHY have I not been more acquainted with his work? My jaw is on the floor at the artistry. I would adore to win a copy of anything he’s done! Thanks so much for the opportunity! 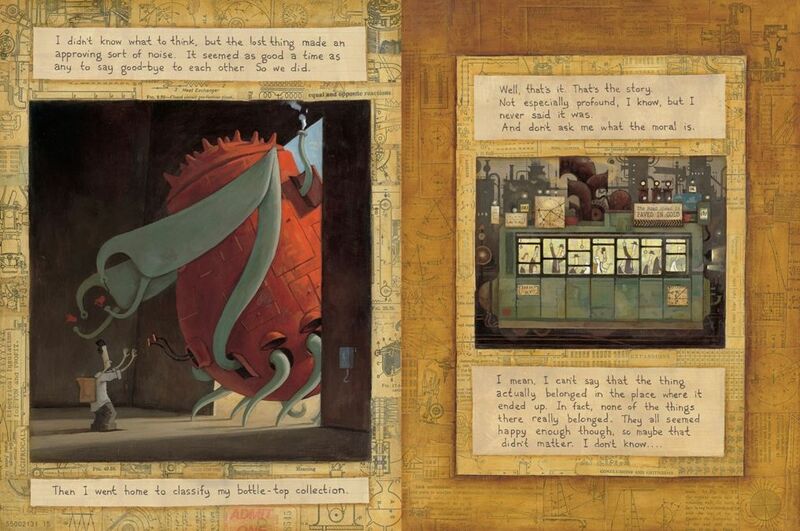 I first found out about Shaun Tan from The Lost Thing. Since then, I eagerly await anything he publishes. I love the rich textures of his paintings. Yes please on my bookshelf please. Absolutely lovely. Would love to win this for my daughter’s third grade reading bookshelf. I imagine many readers “sneaking away” in the beauty of these pages. Looking forward to reading! 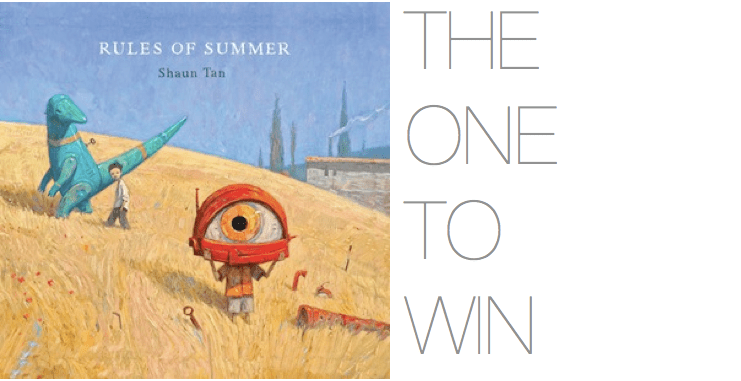 Shaun Tan does amazing work and I am so looking forward to this new book! There’s no illustrator that speaks to me quite as much as Shaun Tan. This book is beautiful. We have a winner! It’s Kristin Gray! Congratulations to her and big thanks to everyone who visited this post and commented!